Before the age of the computer, typewriters fulfilled our need to write faster than our pens allowed. The gentle click of keys on a keyboard are no match for the loud strikes of a letter key pressing paper to inked ribbon and platen to create an inked letter upon a clean white page. The loud ding of a bell signaled the end of a line of type, followed by the slamming of the carriage as a new, fresh line of paper appeared. The history of the typewriter is as intricate as the machine itself. Although visionaries made attempts at a “writing machine” as early as the 18th century, the invention of the first successful typewriter took place in Milwaukee in the late 1860s. These early machines were crude and the keys had a tendency to jam. Mark Twain was an early purchaser of the typewriter though he complained that it made him want to swear. He used it occasionally for letters as early as the 1870s and in 1882 submitted a typewritten manuscript of Life on the Mississippi to his publisher, James R. Osgood & Co. of Boston. By the turn of the 20th century, demand for typewriters soared and Connecticut became an important manufacturing center for this revolutionary new business machine. 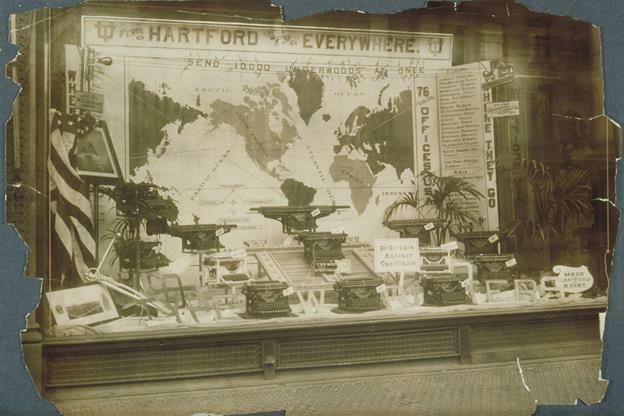 Underwood Typewriters (with its factory in New Jersey) first advertised its product for sale in the Hartford Courant in 1898. 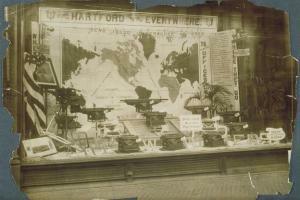 But in 1901, the company moved its factory to Hartford. By 1911, the huge factory complex stretched for blocks along Capitol Avenue. A window display from that period showed the worldwide distribution of the machines, citing their use by the Czar of Russia, the Emperor of Austria, and the United States Navy. 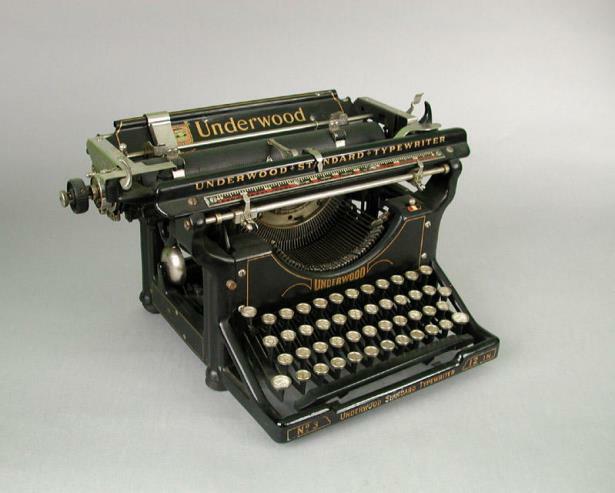 By the end of the 1930s, Underwood had produced over five million typewriters. 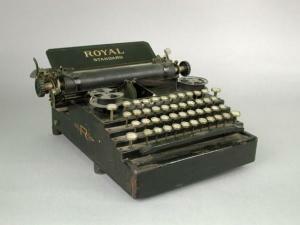 The Royal Typewriter Company—founded in Brooklyn, New York, in 1904— like Underwood, soon found a home in Hartford. It first considered relocating to Manchester, Connecticut, but in 1906, the company purchased property on New Park Avenue in Hartford, and built its new factory there. By the mid-20th century, Royal, with over six thousand employees, was the largest company dedicated exclusively to the manufacture of typewriters in the world. By the end of the 1980s, as personal computers rapidly replaced typewriters in homes and offices, Underwood and Royal merged with Olivetti, an Italian manufacturer of typewriters and computers. By 2000, new technology made the typewriter essentially obsolete. Karen DePauw formerly a Research and Collections Associate at The Connecticut Historical Society.